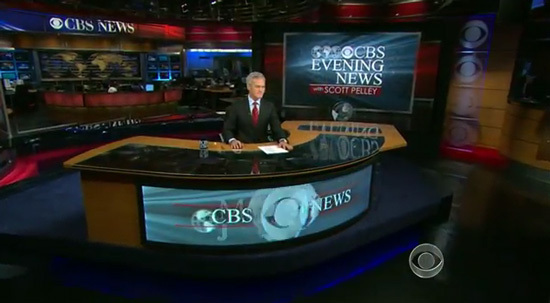 The “CBS Evening News” debuted last night with a new anchor and, along with it, some changes the set. The BDI-designed set, which was built for the 2006 debut of Kate Couric as anchor of the broadcast, now sports some new printed graphics but otherwise remains very similar to its original look. The most significant change to the set is the main background. Originally this background was a world map with peach-toned background, as shown above. During this iteration of the set graphics, the colors were warmer — including reds, oranges and golds. However, that background didn’t last. CBS then swapped out the background for a blue-toned one. For 2008 election coverage, the background was changed out for an American-flag themed one, seen below. The American flag background remained in place until Couric’s final day on the broadcast May 19. CBS’s decision to leave the flag background in place, while patriotic, seemed a bit odd as the election became more and more a thing of the past. The new on-set graphics match the broadcast’s on-air graphics a bit better with a switch to more reds and blues. 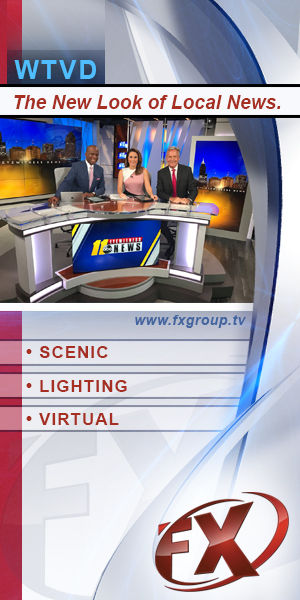 Especially of note are the redesigned header and back lit graphics on the half-wall directly behind the anchor desk. The main map background creates the illusion of a 3D world map mounted in front of a monitor wall. 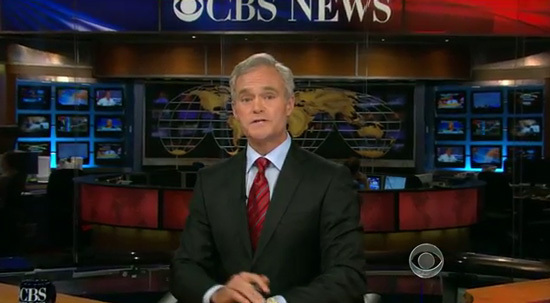 It is interesting, however, that CBS opted to not construct an entire new set for Pelley. It certainly is a much less publicized debut than when Couric took over, and the construction of a new set may have been too drastic of a change as the network strategizes ways to boost ratings for its third-ranked newscast. Funding may also have been a factor in the decision. A new set could have benefited the broadcast, however, by creating a more cohesive look to match the show’s sleeker graphics package. It’s also worth noting that the “CBS Evening News” has maintained the basic layout of its set since the days when Dan Rather anchored the broadcast. That set was also designed by BDI and connection between the two was able to create a sense of continuity while still maintaining two unique designs. In addition to the new on-set graphics, CBS introduced a remixed theme song for the open.